Based on feedback from our vetters (Eric Bone was there 2/17 and Gabe Svobodny 2/19), we have shortened the courses for both days. Eric reported some snow on the ground, with drifts shin- to knee-deep, and a few spots near cliff bases thigh-deep. The warmer weather melted some of the snow by the time Gabe visited two days later. Even if more melts by this weekend, conditions could be mostly slow mud. The traffic camera on I-90 at Exit 143 represents pretty closely the conditions at the event site. Also, if you’re coming from Western Washington, please be sure to check conditions in the passes before heading over. We’re opening the 2017 Ultimate Orienteer Series with a collaboration between Forest Runs and Cascade for a 2-day event in eastern Washington. We’ll be using Forest Runs’ excellent map of Frenchman Coulee near Vantage, WA for Middle (Saturday) and Long (Sunday) events. Temperatures are expected to be above freezing during the day and below freezing at night, with little to no snow. 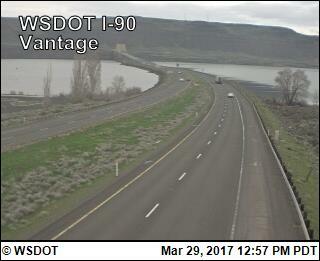 There’s a WSDOT traffic camera near Vantage that you can check for snow cover. The map terrain and surrounding areas are unique and beautiful. Below are some other things to explore nearby. There will be water at 2 locations. Update 21 Feb; the courses have been shorted somewhat. Private property, areas of cultural significance, or dangerous slopes are marked on the map as out of bounds. There are no markings in the terrain, so please pay attention to where you are. One slope is marked on the map, as it might be tempting to cross it, but that would be both slippery and dangerous due to falling rocks. After you’ve finished, if weather permits, the second-last control is a good place to view and cheer on your fellow competitors. Course closure: 2:30pm (return to the finish by this time to avoid disqualification). Arrive early enough to complete your selected course by 2:30pm. The start and finish are approximately 500m from registration/parking. Please allow time for this. Day-of-event registration is available by cash or check, made payable to Cascade Orienteering Club. A Discover Pass is required. There is no on-site dispenser, so if you need a pass, purchase it in advance. The first version of the Frenchman Coulee map was made in 2014 for a Homebrew Orienteering unofficial event. The courses and map from that event can be viewed here. Since then, the map has been extended southwesterly (the “not really field-checked” note has been removed :)) and improved a lot. Fieldwork is still in progress. Ott Toomet, Gabriel Svobodny, Don Atkinson, and Peteris Ledins have all done fieldwork for the latest version. 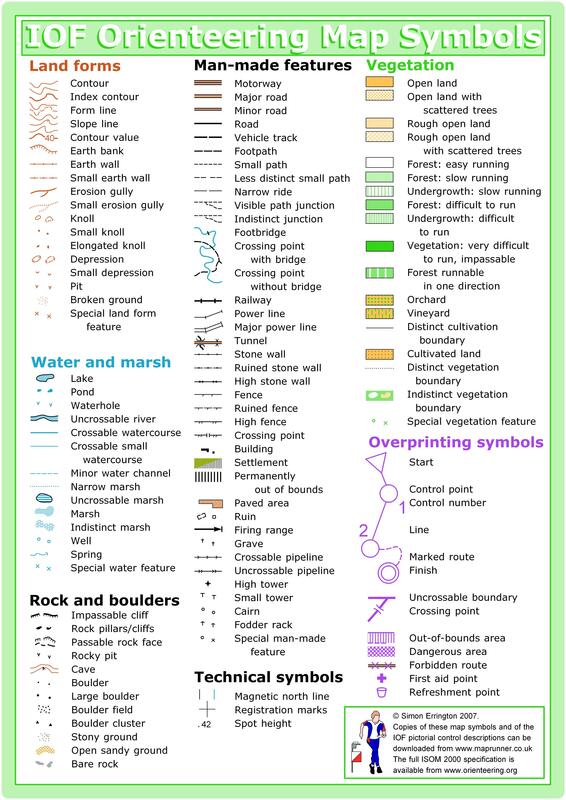 Standard orienteering map symbols are used; there is no legend on the map but we have map symbol sheets available at registration. You can save time by familiarizing yourself with them in advance. The terrain is open semi-desert with large coulee/rock/cliff features (lots of climbing activity near by). We expect 6 min/km for the fastest runners. What little vegetation there is is dominated by sage brush, but much of that is gone – a wildfire swept through a year or 2 ago. There are some larger trees that are now charred. The most prevalent symbol on the map – rough open land. Land cover is very rugged – small stones, cliffs, big stones, boulders. Very tiring for the feet and knees. The footing is tricky, there are many high cliffs (the uncrossable cliff symbol is used for dangerous locations where you must not go). Pits – in lower places which are a bit wetter throughout the year, but not enough to form a pond, meadows can be found. Some parts of the map have been used for livestock and people seem to have tried to get water in some organized shape. Several pits and rocky pits can be found there. Rocky pits can be fallen into. Please don’t do that. Footing – cliffs with sand are slippery, stones roll, ankles too. Please be careful. Rolling stones – if you knock loose a rock, shout loudly: “ROCK! ROCK!” But please don’t do that.